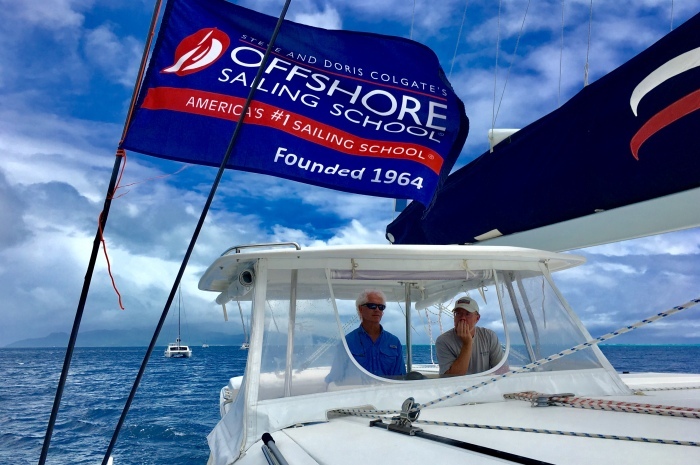 Colgate Sailing Adventures Trip Leaders – Nate and Heather Atwater – recently led another exciting and very rewarding flotilla cruise for Offshore Sailing School graduates and sailors who love to sail. Here is Heather’s diary, and just a few of the fascinating photos provided by the Atwaters and cruise participants. 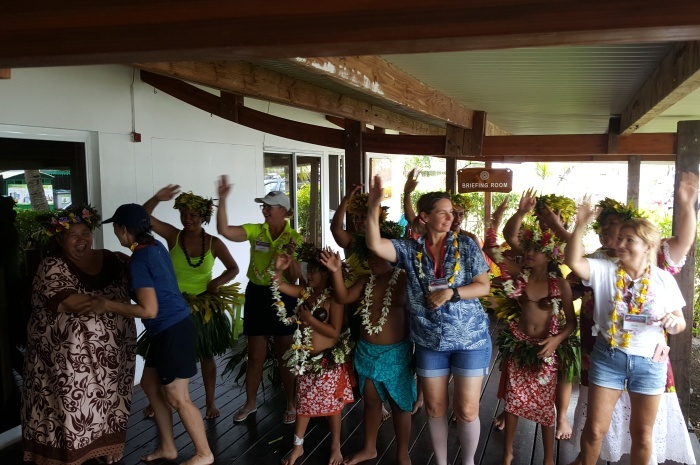 No doubt it is a long way to Tahiti from the East Coast but heck it’s Tahiti, a bucket list item and a place of ‘South Pacific’ dreams. Nate and I flew the economical French Bee from San Francisco into Faaa Airport in Papeete on the Island of Tahiti. 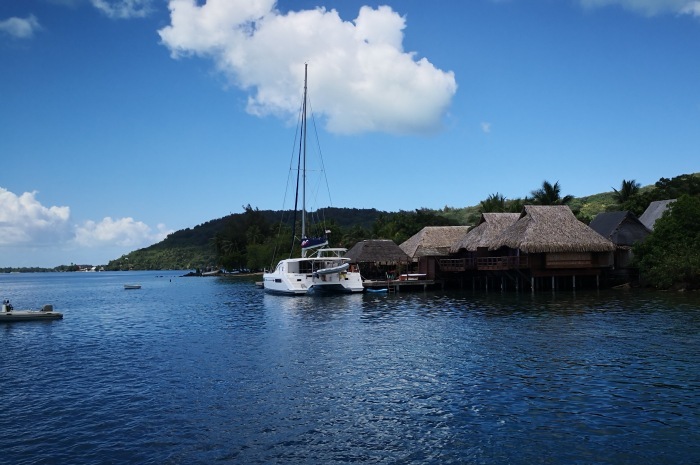 From there we flew Air Tahiti Nui 45 minutes to Raiatea, where The Moorings base is located. 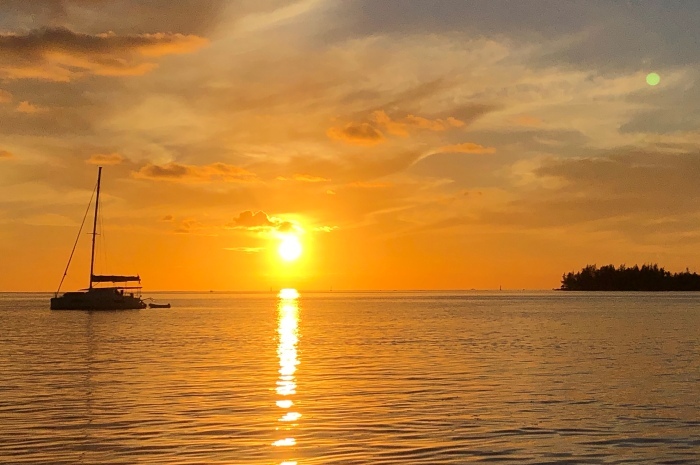 We were booked at the Sunset Beach Motel owned and operated by Moana and his mother, where we enjoyed the friendly and laid back atmosphere, plus the view and the breakfast were to die for. Somewhere along our journey to Tahiti with our travel nightmare delays it must have crept into my mind, “This better be worth it…,” and already morning one, day one I thought to myself, “ Okay, Okay it’s worth it.” Traveling to far away places can be a hassle but it is the only way to get there! We started off the day walking from our lodging to the Mooring Base to meet Laurent, the base manager. 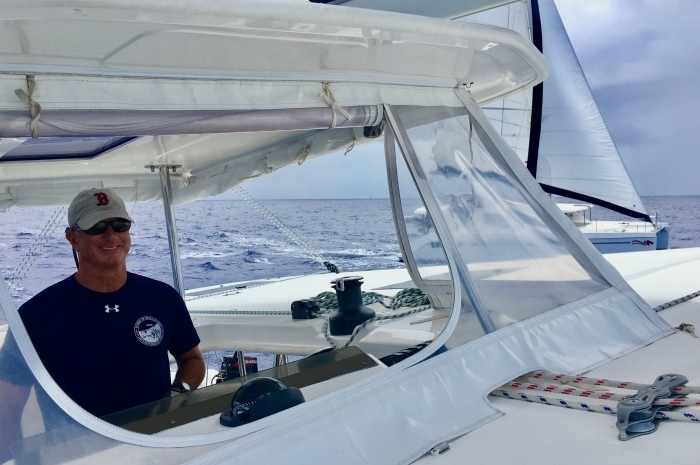 Nate had been studying the Navionics Charts for months and we had been planning the Flotilla details starting back in January. We worked for a few hours going over the itinerary. Though we always try to stick to the plan, often the local knowledge tells us to do otherwise. 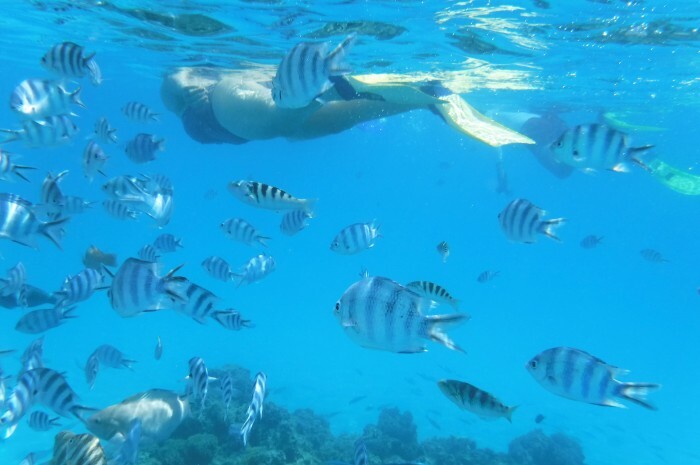 This time we only added a few “Not to miss!” snorkeling spots. That night we got together informally with many of our group at a nearby restaurant for some local food. Our group arrived at the base to a fun welcome party. We were twenty-five sailors from all over the United States, Panama and Argentina. First off, the boats were available early, always a bonus! 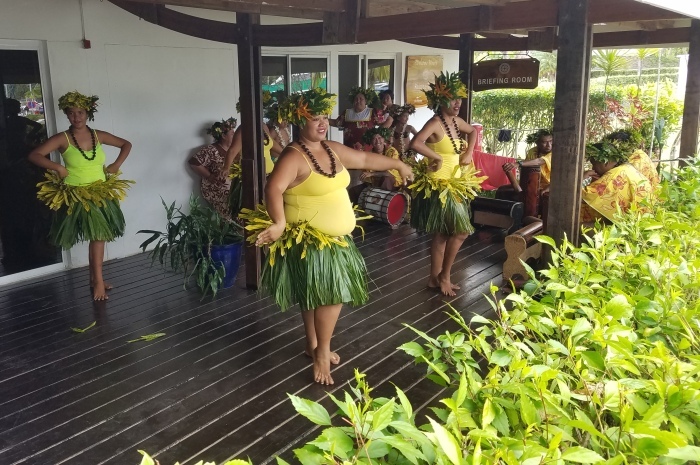 The Polynesian Dance group did a fabulous job and many of us were included in the action!! 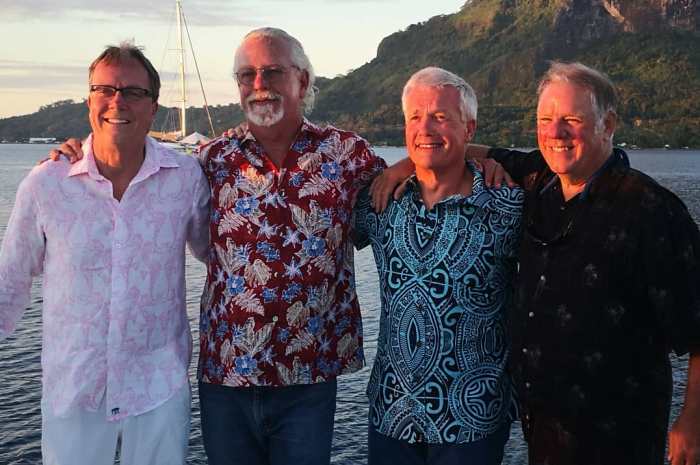 Next, skippers and navigators went to the briefing, while others stowed their gear and provisions aboard four Moorings 4800 catamarans: Bessie – leader boat with Skipper Nate Atwater; Hoku lele with Skipper Mike Mahan: Miss Kayo with Skipper Rick Franz; and Leo with Skipper Bill Roberts. It was the best navigational briefing we have ever had but it did take a while. 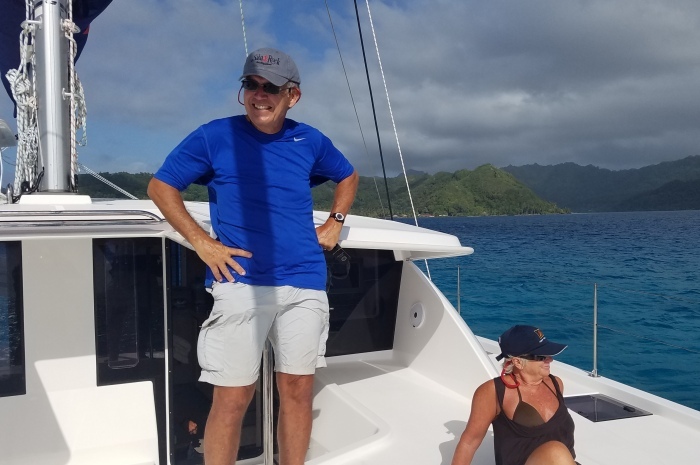 So, by the time we did all that as well as the boat check, we got underway at 3 pm to our first anchorage off the Southern tip of the Island of Tahaa. There were a few moorings provided by a Black Pearl farm and the rest of us anchored. 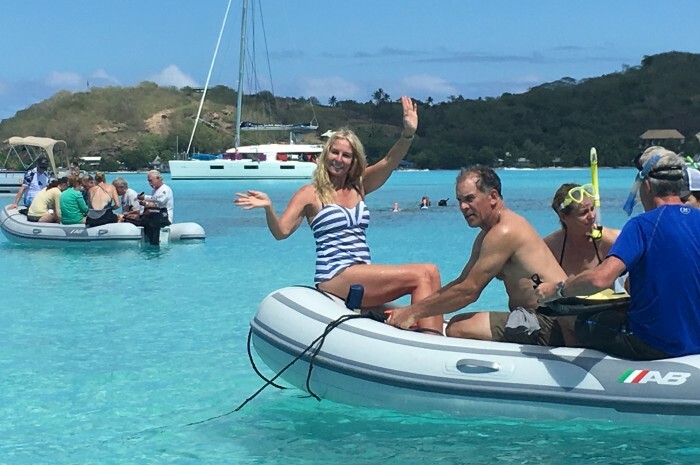 We were so happy to be there we enjoyed the first of many swims in the beautiful, clean, clear Tahitian waters. Later, we all gathered aboard Bessie for cocktails and watched an amazing sunset while we got to know our crew members. 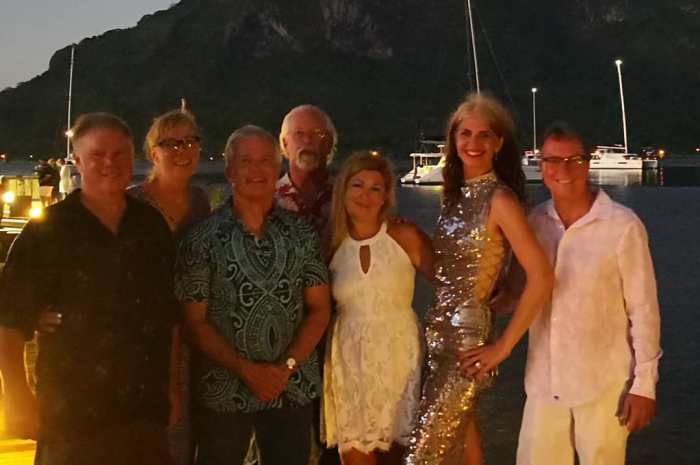 It was the first of many fun evenings in French Polynesia. That night we cooked a yummy dinner aboard. Today we are off to Bora Bora! I always rise early and here is no exception. I notice the sunrise is amazing and different; the clouds are so voluminous and tall that it paints a picture, ever evolving with mauves and pinks. It is indescribably beautiful against the backdrop of the dark ancient volcanic islands. Wow! After breakfast aboard we head to Bora Bora around 8 am. We got out of the cut from the lagoon to the open ocean for a three-hour trip and with no wind so we powered to get there. 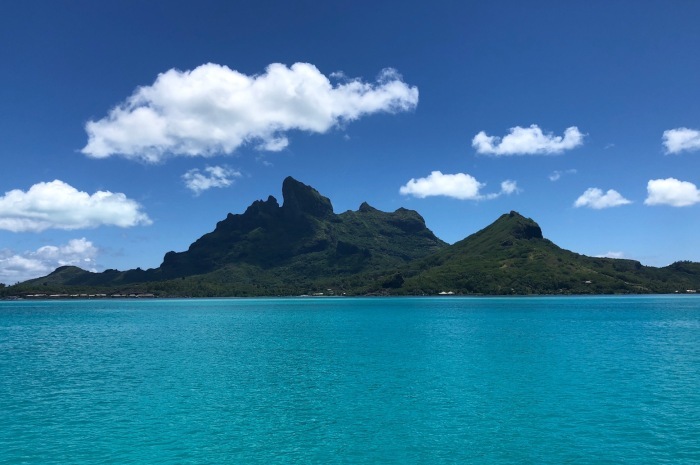 Once in the cut at Bora Bora we wove clockwise around the Lagoon avoiding shallows and coral to an anchorage on the SE corner off Pointe Fareone. We passed very high-end resort bungalows suspended over the water on stilts. The water is crystal clear shades of blue and it is easy to see the line where it goes from ten feet depth to four with a clear white line in the sand. 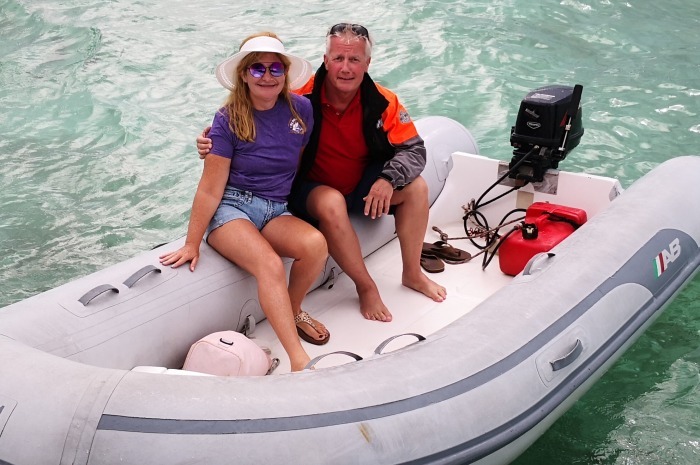 We anchor and jump into the dinghies to do some snorkeling off the point. A first for our flotillas, some aboard watch the Red Sox win the World Series. Never have we had such connectivity. 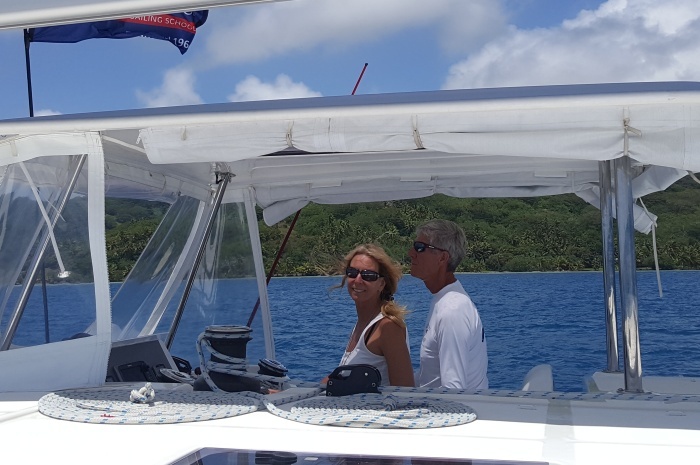 It is a sparkling day to wake up to, anchored off Bora Bora, and we start off snorkeling the nearby ‘Aquarium” where we see a wide variety of tropical fish, squid and octopus. The color patterns of the oysters, clams and fish are diverse. It is incredible to watch the squid change its colors from red as it swims to white matching its surrounding sand in perfect camouflage. We enjoy the water for as long as we can but the sun is so strong South of the equator. After lunch back on the boats, we retrace our path around the reefs to the Bora Bora Yacht Club. Losing a race for a mooring we anchor in 75 feet of depth right off the shore and others take moorings or tie up to the dock. The town is a short cab or walk away. I, however, am suffering from sun combined with strong antibiotics for my long term Lyme disease so I stay in the shade while most head to town to explore. That night we all enjoyed the group dinner that was part of the Flotilla package. A fruit cocktail to start, choice of Red Tuna with sautéed vegetables or a local ‘Cane beak fish’ which was delish with veggies and rice or a black angus steak with potatoes and veggies. Dessert was a choice of Crème Brulee or Chocolate Brownie a la mode. 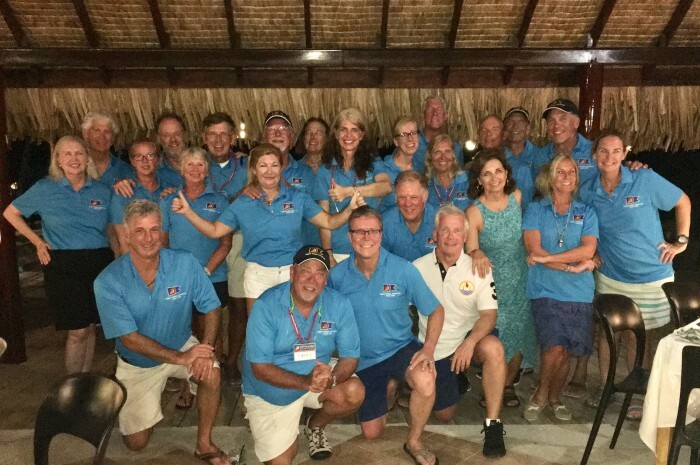 We took our ‘Groupie’ photo along with lots of others and a good amount of Bora Bora Yacht Club clothing was purchased (#Onceinalifetime). As we pick up our anchor off the Bora Bora Yacht Club the windlass on Bessie loses its grip on the internal gears as the splice from rope to chain separates the plates. After a bit of fussing with it we manage to fix it. Meanwhile the rest of the Flotilla sets sail for a short while, then we head to our snorkeling/lunch spot. After a swim and lunch we motor around to the famous Bloody Marys Restaurant where we pick up moorings. Nate and a few others take the dinghies to get more fuel, others taxi into town and others fill up with water at the dock. 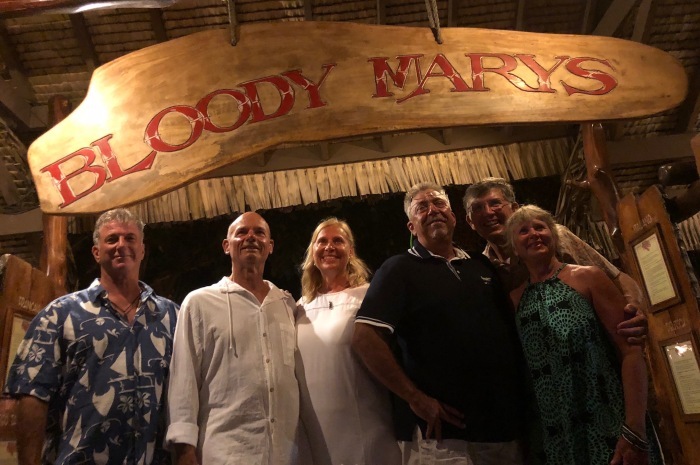 Dinner that evening at Bloody Marys was a real experience. You choose your meal from a spread of fresh fish and meats on ice at the front of the restaurant to be prepared how you desire. Kelly Kaleen made it fun also by giving us all Halloween goody bags and for me a unicorn headband. All had a fun time. We got an early start out the pass from the lagoon around Bora Bora towards Tahaa. Soon we were able to sail tacking to avoid weather fronts passing through and sailing for as long as possible. 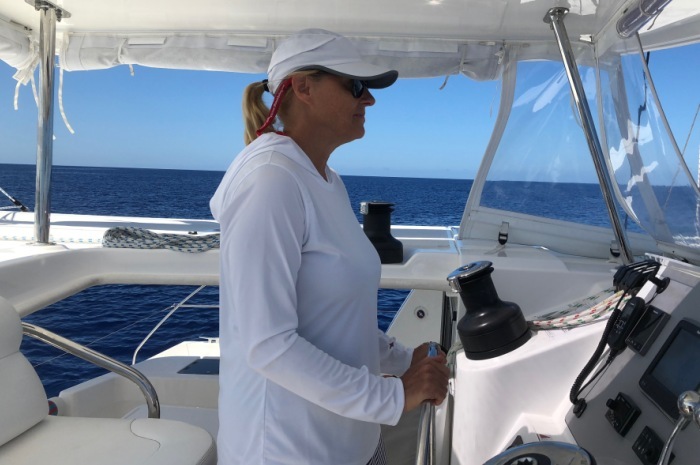 By the time we entered the pass on the west side of Tahaa it was blowing around 20 knots. 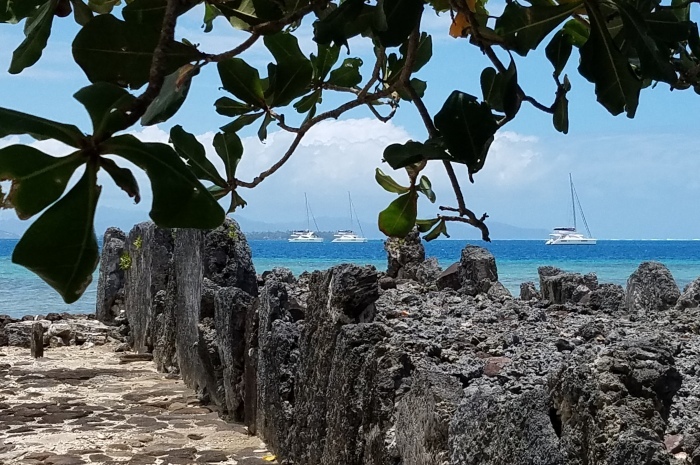 After anchoring on the North side of the Tahaa resort some of us dinghied ashore to check the place out. Bill and the Hart’s had stayed there before the Flotilla began so Bill gave us the tour and led the way to the stunning poolside bar where some drank out of coconuts. That night we grilled our fish and ate another tasty meal aboard with Bessie’s crew Sandy, Bobby, Ken and Diana. 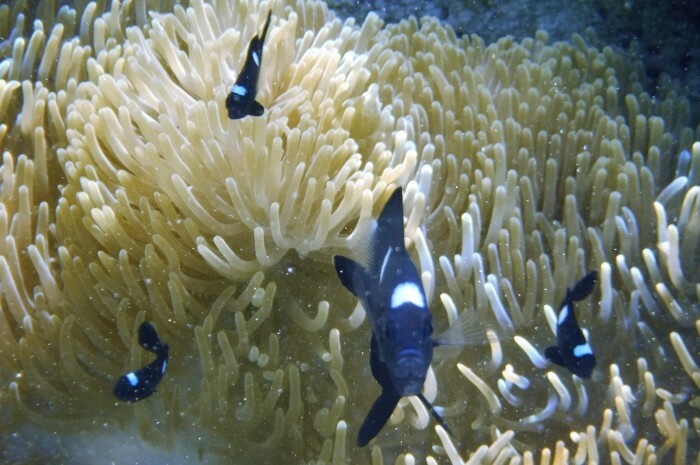 We had an early morning drift snorkel at the Coral Gardens off the Tahaa Resort. It was fabulous!! 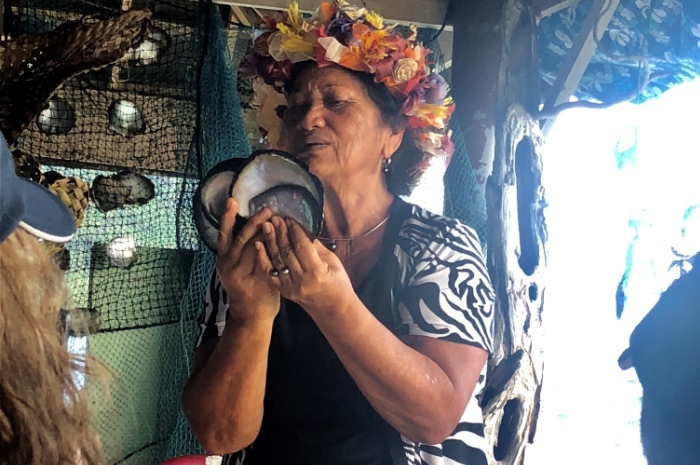 Our next stop was Haamene Bay via lunch hook at Motu Mahaea near Passe Toahotu. Some went ashore at this small island while others swam or just relaxed. 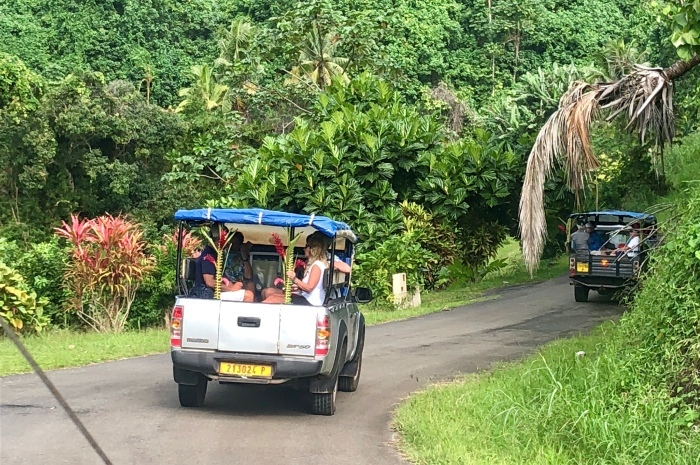 Ken had put together an onshore excursion leaving from Haamene Bay with tours of Pearl Farms, Vanilla Plantation and other land based attractions on Tahaa. Turned out the information we received about moorings was not accurate and the loose mud bottom where we lay our anchor was not working for us. Although we FINALLY got it to hold Nate and I had no faith in the holding ground (our anchor had been bent all along, which was fine in the sand and light air but not good in this mud). Nate and I stayed aboard to monitor our anchor situation while the others went ashore to go on the Land tour. The restaurant that we had made reservations at was closed so most availed themselves of the local food trucks for a makeshift dinner. Everyone was exhausted that night! After a light sleep, the wind piped before daybreak and with every gust Nate and I took turns popping our heads up to check our position out the porthole. Sure enough, after a heavy gust we broke free. 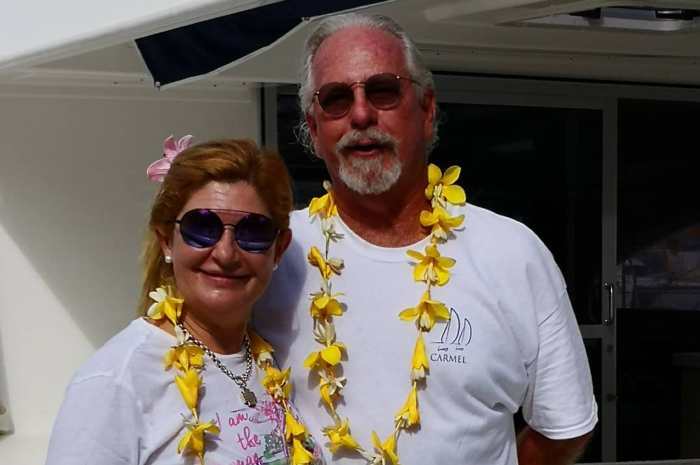 As I went aloft, I met Bobby Hart’s gaze and we simultaneously said, “We are dragging.” I said, “Start the engine,” and he started the starboard engine as I started the port engine and went to the bow to retrieve the anchor. We met up with the other boats – Leo, Hoku Lele and Miss Kayo – at the Passe Toahotu just outside the bay. The wind did not seem bad, gusts to 22 knots, but we watched a monohull try and head out the pass directly into the wind and fetch. They hobby horsed and turned around part way and came back and anchored next to us. Nate and I decided to take the inside route to our next stop at Marae Taputapuatea an ancient Tahitian temple and ruins. We set the genoas and sailed reaching south toward Raiatea. After anchoring in the sandy spots most dinghied ashore to the ruins. It was quite an emotional and beautiful landmark where the Polynesian men would gather before leaving on long voyages in their canoes discovering new lands, often never to return. 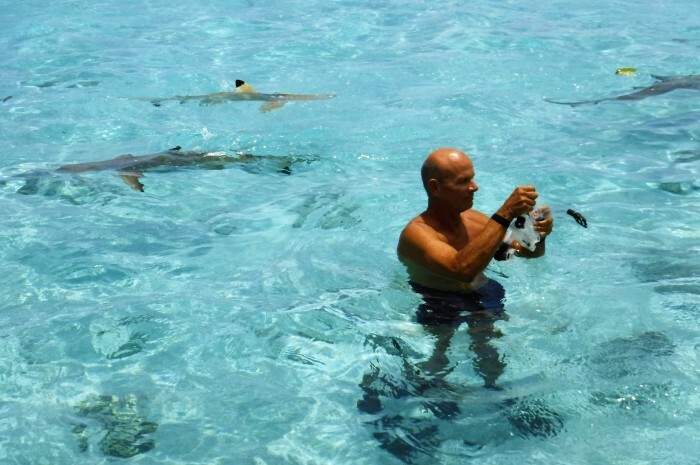 After this we set sail again to our final anchorage in the Baie Faaroa. Once settled on our moorings we again got into our dinghies to take a tour up the river Aoppomau. 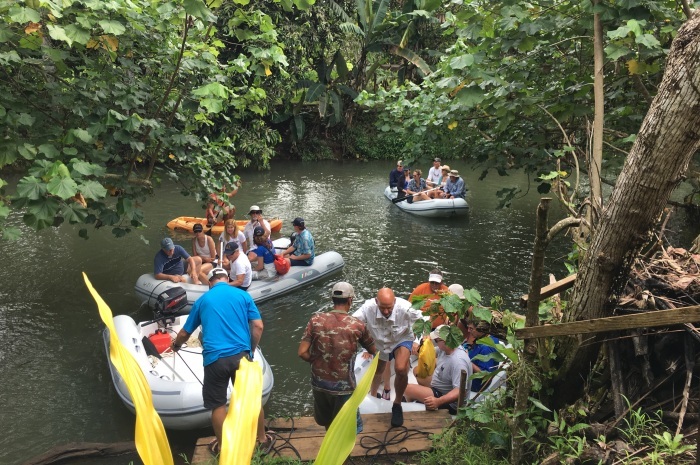 We were then met at the mouth of the river by James and our four dinghies traveled up the river to James’s brother’s “Plantation” for an interesting tour. For me, it was a short glimpse into what many Polynesians today have to do to exist. It is a very basic life. We got the tour and tried a few of his different crops and coconut water. James’ brother sent us back to the boats with cucumber and string beans, which were put to use for our final potluck dinner aboard Bessie. We all came up with unique ways to cook up what was left onboard and all enjoyed a wonderful last night dinner party together. We dropped our moorings early and headed back to The Moorings base. It is a whirlwind of activity both the first and last day of any Flotilla and this one was no different. Some had early flights while others could relax the day away. Boat checks were completed and everyone, including Nate and I, said our goodbyes. 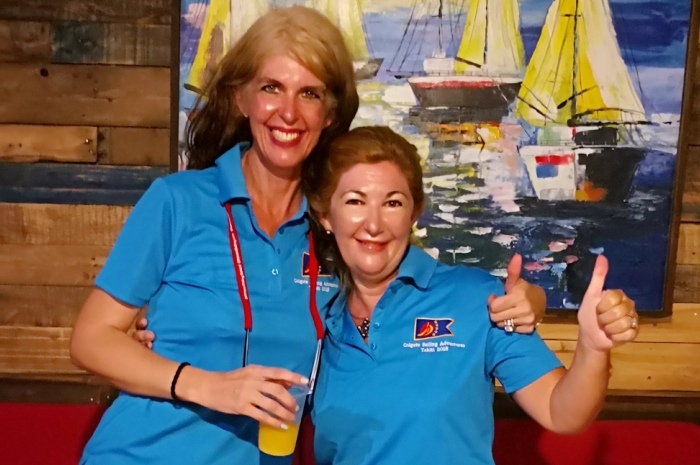 Another Offshore Sailing Adventure at its end, with lots of incredible memories to look back on and friendships to continue. Next adventure is St. Lucia to Grenada and then back to Grenada! 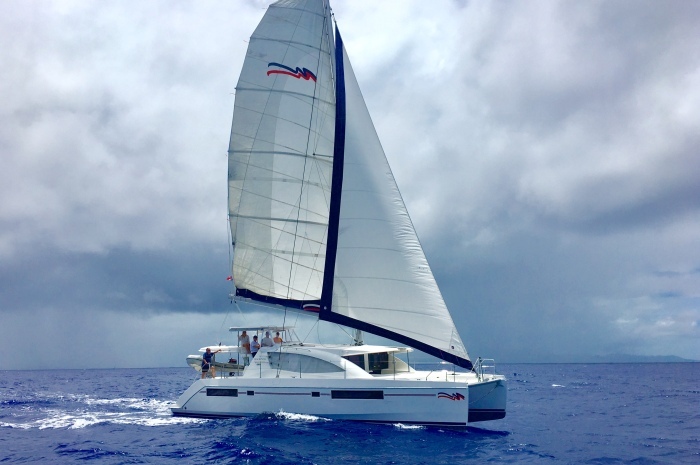 Join us for both legs or just one on another Colgate Sailing Adventures – this time in the Windward Islands of the Caribbean.